Gioconda de Vito (1907-1994) was one of the few female violinists able to establish themselves as soloists on the concert platform during the first half of the 20th century. Born in the South Italian region of Puglia, the artist studied in Pesaro and Rome, accepting her first professorship at the tender age of seventeen. De Vito built an international career which took her as far afield as Argentina and Australia. In Germany she was especially highly regarded during the 1930s and 40s. Bach, Beethoven and Brahms represented the main pillars of her repertoire which, however, largely eschewed more modern music. De Vito cultivated a sumptuously romantic tone and never sought superficial violinistic brilliance. In 1961, aged only fifty-four, she retired from the concert stage. 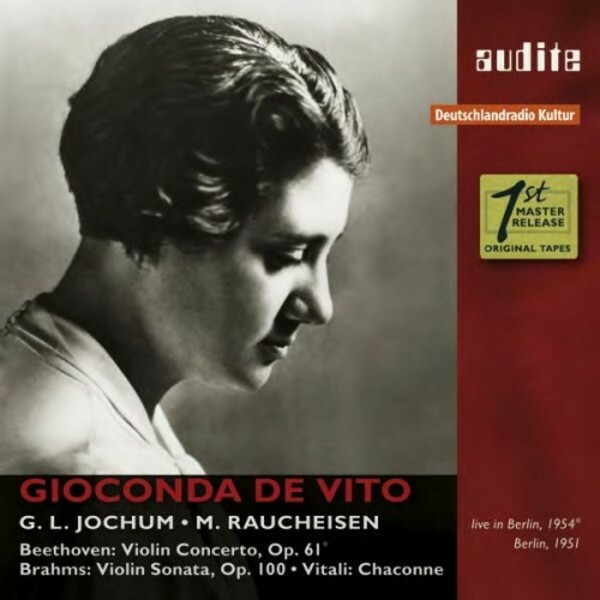 De Vito never recorded the Beethoven Violin Concerto in the studio: this sole live recording from 1954 with the RIAS-Symphonie-Orchester under the baton of Georg Ludwig Jochum presented here is therefore of particular documentary value. Recorded 1954 (Beethoven, live) and 1951.